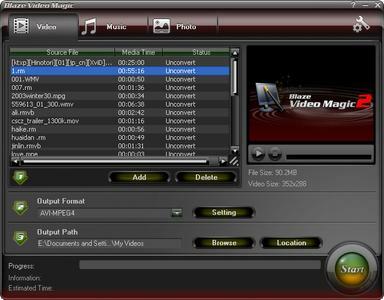 Blaze Video Magic is a powerful but easy to use utility for multimedia file conversion. Expanding your multimedia entertainment, Blaze Video Magic realizes you to freely access and enjoy video, music, photo on PC, MP3 player, portable MPEG4 device, PS game player or 3G smart phone. Possessing Blaze Video Magic, you will have a wonderful and extensive digital entertainment life. Convert Video: You can convert *.RM , *.RMVB , *.AVI , *.WMV , *.ASF , *.MPG , *.MPEG , *.MPE , *M1V , *MPV2 , *.MP4 , *.DAT , *.MOV , *.VOB file to AVI-MPEG4 , ASF-MPEG4 , MP4-MPEG4, PSP-MPEG4, 3GP-MPEG4, AVI-DIVX file. You can also split a large file into smaller video clips to fit your device memory. Convert Music: You can convert all files with audio to MP3 format. 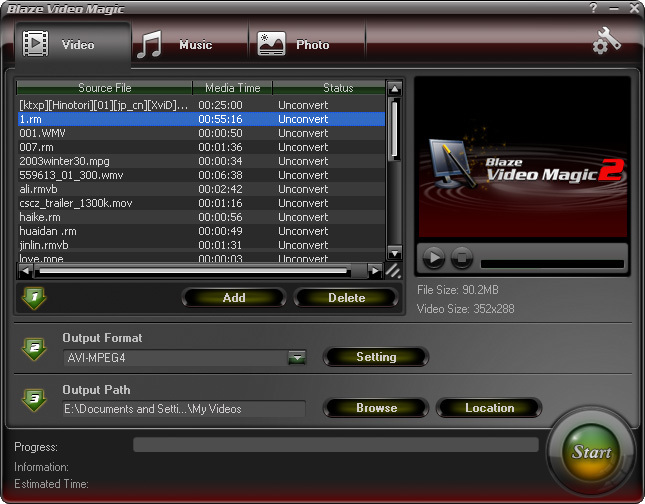 You can directly convert audio file, or extract sound tracks from video and save as MP3 format. Convert Photo: You can convert pictures such as *.BMP, *.JPG, *.GIF, *.TIF, *.PNG to JPEG format. Convert video, audio, photo to have them fit on portable devices: Sony PSP, Apple iPod, PMP, etc.